This terrific guest review is from Poe Ghostal. You may be familiar with his reviews at Action-figure.com. Take it away, Jason! The next wave of Lord of the Rings toys are just starting to hit the shelves. First up are two 2-packs: Sam & Frodo with Boat, and Gimli & Uruk-Hai Warrior. They've been available at online stores like Toybliss for a few weeks, but they're finally starting to hit the brick and mortar stores. I picked up the Gimli & Uruk set at my local Toys R Us. This is the second Gimli from this line, and the first "generic" Uruk-Hai. I can't say I'm really a fan of the packaging. The colors are nice, but the graphics are pretty weak. The cardboard around the blister somewhat obscures the figures, so it's not exactly collector-friendly. Also, in some of the packages I noticed that Gimli's face is often blocked by the double-bladed axe in his hand. The sculpting is where this set really shines. When the LOTR figures first hit, there was a lot of press about how the figures were creating using the Real Scan technique, in which the actor's heads were scanned with lasers and to create a 3D model. Ironically, in the last set, the best likeness was not produced by Real Scan but by a sculptor, Phil Ramirez, who did the head for the Saruman figure (Ramirez is also the sculptor behind the upcoming Marvel Legends line from Toy Biz). Ramirez sculpted the head for the new Gimli, and it's ten times better than the sculpt on the stand-alone Gimli from the first line. It's a dead-on likeness to the film - you can even detect a hint of John Rhys-Davies in there. The rest of his outfit is fantastic too, from the rings of his chain-mail to the detailing on the axes. The Gimli sculpt is as good (if perhaps a little better) than anything we've seen from McFarlane. The only complaint I might have is the slight pre-posing: the flaps of his shirt and his cloak look like they're being blown about in the wind. The Uruk-Hai warrior is a bit of a different story. I suppose I can't really have any complaints about the likeness, since he's just a generic orc. But the sculpt lacks, for lack of a better word, "oomph." I find the legs particularly annoying - they're a little too close together, so the figure falls over easily. 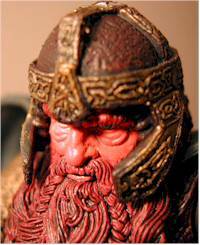 The paint application on Gimli's helmet and face are amazing. You can even see the blue in Gimli's eyes. There are some splotches just below his waist - I'm not sure what these were meant to represent, but it doesn't look too bad. Parts of the Uruk's head are a tad splotchy, but nothing too noticeable. Overall it's a pretty good paint application. This is Toy Biz, so you know you'll get some decent articulation. Gimli's got some slightly unusual but still useful information. He's got ball-jointed shoulders - impressive on a figure with an arm-based action feature - but no pin elbow joints. Instead, he's got a cut joint at the bottom of his biceps, and a cut joint at the wrists. On a figure as small and stout as Gimli, this was probably the way to go, and I don't think the figure suffers for it. He's got a cut joint at the neck and a t-crotch for the hips. Plenty of articulation for a figure this size - the only thing lacking is a waist joint, but they probably had to remove that for the action feature. The Uruk-Hai's articulation is a bit disappointing. He's got ball-jointed shoulders, pin elbows, knees and ankles, twists at the neck and waist, and a t-crotch. Unfortunately (and inexplicably) he has no wrist articulation, which would have been a cool addition to this figure. Gimli got the works this time. This is meant to represent Gimli at the Battle of Amon Hen (at the end of Fellowship of the Ring), so he's got his green cape from Lothlorien. But the cape is removable, which is all you really need to make him Gimli from the rest of the movie. He's also got a removable helmet (finally!) and no less than four axes - two small ones, one long one and one long double-bladed one. The small ones are for throwing, and one small axe can be slid into a holster on his side. The details on all the accessories are fantastic, particularly the helmet. It goes on and comes off easily, and it doesn't even look too big - something that often occurs with removable helmets. 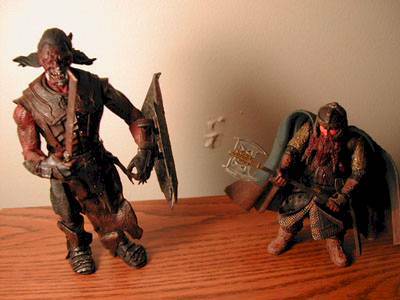 Apparently Toy Biz blew the accessory budget on Gimli, because the Uruk-Hai was robbed. He's armed with a rubbery sword that is clearly too short for him and a shield that, while looking cool, doesn't hold very tightly to his arm. 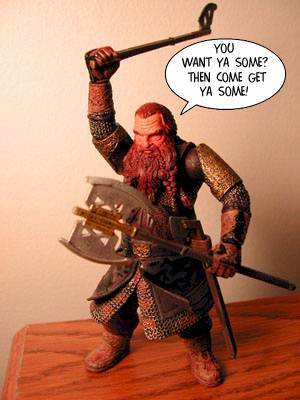 Gimli's action feature is to toss his axe. First, you squeeze his legs, and his right arm rises up. Hook the end of one of the short axes into his right arm, then let the legs go. He'll toss the axe, and if you do it right he can toss it pretty far. Aim well and he could even knock another figure over. It seems to me that it would make more sense to raise his arm, hook the axe and then squeeze the legs so he throws forward, but that's not how it works. I'm not huge on action features, personally, but this one is pretty cool. The Uruk is less interesting. He's got a little thumb-tab on his back - when you use it to turn his waist back and forth, he kicks his legs and swings his arms. Not very exciting, but for those who play with their toys it's probably a fun way to smack other figures in the face. I picked these up at TRU for $12.99, which I think is a fairly good price for two quality figures. I'd almost pay that much just for the Gimli. But if possible, I'd avoid the high prices you'll find on the 'Net. This is a great deal for $13, but any more than that and you're paying a bit much. 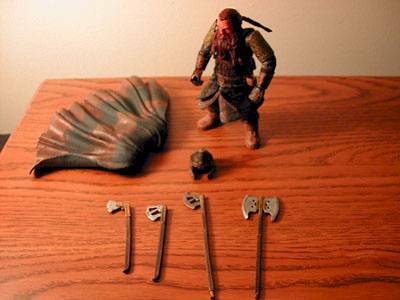 Gimli is one of those rare figures that I liked much more once I'd opened the package and played around with it. It's the perfect Gimli, the one I've been waiting for. It's light years ahead of the original Toy Biz Gimli. The Uruk-Hai is weak, however; he was just along for the ride. As I mentioned, these toys are starting to hit the brick and mortar stores. Check your local TRU and Kay-Bee Toys before hitting websites like Entertainment Earth and Toybliss.com. Figure from the collection of Poe Ghostal.